Designed around the same beautiful lines as the legendary Pulsar XP, the "Super Pulsar 100." 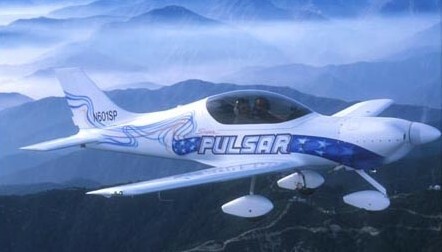 was introduced by Pulsar Aircraft Corporation In August 2001. A high performance sport airplane capable of cruising at speeds over 200 mph but yet docile and safe for low time pilots . It's 2500 fpm climb will leave you breathless and it's docile and slow flight stability lets you land on short fields. 38 gallon fuel capacity for seven hours of endurance and 1250 mile range. Speaking of endurance, building the Pulsar will not test your endurance like some of the other kits on the market. with the Fast Build option You can build it in under 500 hours. All composite parts are pre-formed and hardware parts are pre-machined, leaving little to be fabricated by the builder. Fuselage shells and Vertical Fin are joined at the factory, and the Wings come Structurally assembled with fuel tank sealed. A completion stage that is unheard of in the kit industry.